Four proposals have been made to build on Block 7 and the “liner” site in front of the downtown parking ramp between Riverfront Terrace and Wisconsin Street. Developers have stepped forward with proposals for a pair of downtown Eau Claire lots that have remained undeveloped as new apartments, office buildings, and a parking ramp have risen around them. Three of the four plans, which were announced by the City of Eau Claire on Oct. 5, include a new building for the Children’s Museum of Eau Claire. The two vacant properties are along North Barstow Street between Riverfront Terrace and Wisconsin Streets. 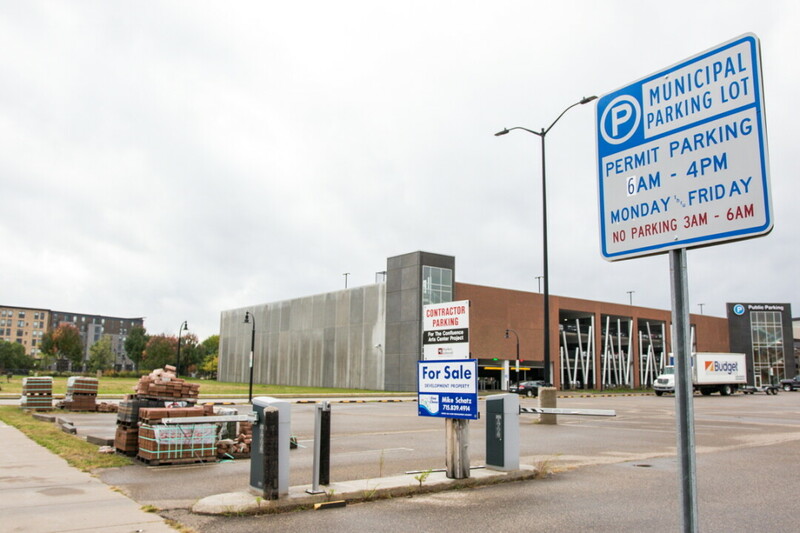 The larger of the two – known as Block 7 or the Livery lot – is now a temporary parking lot. The other, generally referred to as the “liner” site, is in front of the downtown parking ramp where the post office formerly stood. According to the city, the developers who submitted proposals for both sites are Commonweal Development Corp.; Pablo Properties; and Merge Urban Development Group. Hoeft Builders Inc., on behalf of one of their its clients, submitted a proposal for the line site only. The three proposed projects that encompass both sites include estimated construction costs of at least $30 million. Specifics of the four plans have not yet been released by the city. The city last issued a formal request for proposals for the sites in 2015, but only received one plan at that time. Earlier this year, in response to renewed inquiries from developers, the city set a Sept. 28 deadline for new ideas. Developers responded with what Scott Allen, the city’s community development director, termed “four very strong proposals.” The Redevelopment Authority, the city-affiliated entity that owns the properties, is expected to discuss the proposals at a special meeting at 7:30am Tuesday, Oct. 23, in the Eau Claire County Board Room. The current museum is about 15,000 square feet, but the hope is to expand it to about 21,000 square feet, said Executive Director Michael McHorney. A new location would also allow the museum to include the outdoors and green space in its programs. The museum hasn’t yet begun fundraising for a potential move, McHorney said.